The RSS being trained in a military style camp, wearing their uniform of a white shirt and khaki coloured shorts. Rashtriya Swayamsevak Sangh (RSS), which means ‘National Patriotic Organization’, is a right-wing Hindu nationalist, paramilitary, volunteer, and militant organization for Hindu males in India. The RSS is a part of the umbrella group of Hindu nationalist organisations – Sangh Parivar. The Rashtriya Swayamsevak Sangh (RSS) was created in 1925 to spread the concept of India being a Hindu nation and Hindu culture. Keshav Baliram Hedgewar to set up the organisation and become its first leader, however, it is Madhavrao Sadashivrao Golwalkar who firmly established the RSS in the Indian political scene. Golwalkar was the one who developed most of the strategies that are still in use by the RSS and he gave the RSS the vision that still inspires its members. Hedgewar developed his organization as a street-fighting machine; members were well trained to fight the “enemy” and enhance passions by the disinformation campaign. The RSS continues to be a master of the rumour industry. Lower caste communities are utilised to do the dirty work of rioting once they have been initiated. The credit for this transformation goes to Hedgewar. The group is organised through camps where members meet and train. 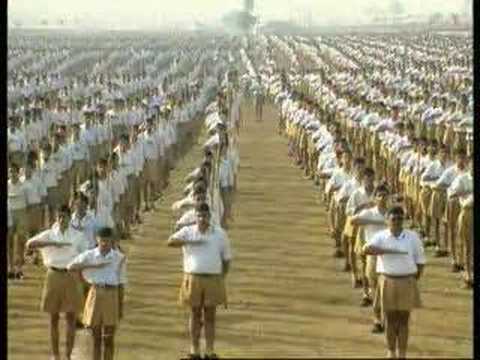 In their daily prayers the RSS sing before the Bhagava Dhwaj (Saffron flag), which is regarded as the supreme Guru. The slogan of the RSS is “Bharat Mata ki Jai” (Long live mother India). The mission of RSS is to unite and rejuvenate the ‘Bharat’ nation on the sound foundation of Hindu Dharma. The RSS is striving for a strong and united Hindu society and the vision of Hindutva. It’s definition of Hindu is anyone born and belonging to India. This includes Sikhs, Buddhists and Jains. The RSS is opposed to anyone who tampers with India’s unity and integrity, it has 30,000 branches in India and 35 abroad. The RSS is connected to the anti-Muslim genocide that took place in Gujarat in 2002. The Rashtriya Sikh Sangat group, which is a branch of the main Rashrtiya Swayamsevak Sangh and is also known as the RSS which was formed in Punjab in 1986 claiming to promote Sikh-Hindu relations. The Rashtriya Sikh Sangat has 500 branches across India and publishes the magazine ‘Sangat Sandesh’. It’s main aim however is to attack and swallow the Sikh religion, and how is it trying to do this? Over the last two years, the RSS has intensified its attention on Sikh affairs in Panjab. At every given opportunity, it has tried to build inroads into Sikh institutions and attacked the basic Sikh philosophy and way of life. By any means possible it is trying to undermine the history, the beliefs and institutions of the faith. Shamsher Singh of Lucknow was the first national and international Coordinator and convenor of Rashtriya Sikh Sangat. The next President was Chiranjiv Singh of Patiala. Gurcharan Singh Gill of Bharatpur (Rajasthan) was the next President of the organisation. The late Rulda Singh was the president up to 2009 up until he was assassinated. Rulda Singh was not only a spokesman for the Rashtrya Sikh Sangat wing of the RSS, but he has also served as Bhartya Janata Party’s (BJP) NRI General Secretary, and key liaison between the RSS and the Akalis and organizations linked to the Sant Samaaj. In secret footage exposed by Panthic.org in January 2006, Rulda Singh acknowledged that he reports to ex-BJP supremo LK Advani, and is more than anxious to bring the Sikh leadership under the wings of the RSS. The 2006 expose of Rulda Singh showed how far the RSS with the support of other agencies had infiltrated Sikh institutions, bodies and organisations with the aim to assimilate the Sikh religion into Hinduism. The attempt to subjugate the Sikh identity by the dominant and elite Hindu stream is nothing new. In the earlier part of the nineteenth century, Swami Dayanand Saraswati of Arya Samaj came down heavily against Sikh Gurus, Sikh scriptures and the Punjabi language, in response to which Bhai Kahan Singh wrote the famous book, ‘Hum Hindu Nahin’ (We are not Hindus). The current threat to the Sikh identity assumed serious proportions when the RSS chief, K. Sudarshan, while participating in the Rashtriya Sikh Sangat Convention in Amritsar (April 2000) said that Sikhi is a sect of Hinduism while the Khalsa is a part of mainstream Hinduism which was created to protect Hinduism from Mughal tyranny. From that time on, many Sikh organizations undertook protest marches against Sudarshan and pointed out that Sikhi is a religion in its own right and that they will not tolerate the RSS efforts to undermine their separate Sikh identity. Since the 1980s, Sikhs have been a thorn in the side of the Hinduvta movement and it is in its best interest to neutralize them in order to accomplish it goal of final assimilation of all Sikhs into the Hindu fold. Given the historical track record of key players and entities of the Hindutva (Hindu nationalist) movement, it is not inconceivable that this same design and ‘final solution’ is being applied to other racial and religious minority communities as well. A poster calling the milk from a cow 'Amrit' and depicting the Sikh Gurus within a cow and the Bhagats in the feet of the cow because Hindus considered them 'low-castes'. Shaheed Bhai Mati Daas, a Sikh of Guru Teg Bahadur Ji, depicted as a Brahmin martyr and given the surname 'Sharma'. The younger Sahibzadey depicted as being blessed by Raam. Guru Gobind Singh Ji put on the same level of national Hindu heroes. The RSS has 25 points with which it hopes to attack the Sikh faith and lead to its eventual assimilation. All 25 points are very easily refuted but lack of education and knowledge coupled with the RSS’ organized attack make this a serious danger. These points are already being incorporated into school text books and taught as real history. This skewed history is already taught in many areas. 1) Sikhs are an inseparable part of Hindu society. 2) If Hinduism is a tree, Sikhi is a fruit on that tree. 20) To create the Khalsa, Guru Gobind Singh seeked blessing from the gods and goddesses and used Hindu mantras. The Kakaars were also blessings from the gods. 24) Project Guru Gobind Singh as having taken a different ideology from Guru Nanak and to make him into a Patriotic Hero of India. 25) Make all of Sikh history take a Hindu tint. « Does God really forgive us? If so, why would He want our afterlife to be Hell?